The Great Eruption of 1447 B.C. The present paper is an attempt to apply the basic principle of systematics to the elucidation of a remarkable combination of natural occurrences and historical events. The systematic principle is based upon the hypothesis that there is a structure in the real world that transcends the distinctions of subjective and objective experience. In one form, this asserts that there is a homology of thought and things, a similarity of structure in the way things are, and in the way we know them. This can be called systematic epistemology. Another form of the principle asserts an homology of events in themselves, so that we should expect to find similar structures in events that differ in scale, content and environment. A special consequence of the principle of the systematics of history thus formulated, is that there should be a similarity of structure as between geo-physical occurrences and the events of human history. The observation of such similarities might be expected to give rise to belief in the providential or miraculous direction of history, of which a classical example is the drying of Jordan to enable Joshua to enter and conquer Palestine. On the face of it, the story is either a myth or a miracle. For nearly three thousand years, it was accepted as miracle-history, for more than a hundred years it has been regarded as a symbolical myth. But comparatively recently, the mechanism by which just such an occurrence is produced has become known. Jordan forms mud banks that build up in flood times and form steep cliffs, but do not obstruct the course of the river. 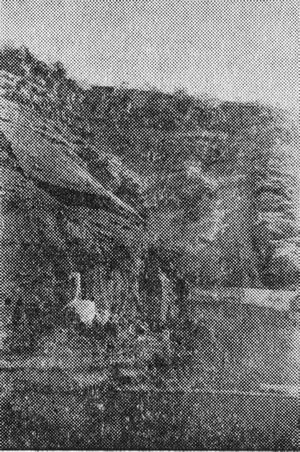 Very occasionally it happens that a severe flood - perhaps accompanied by an earth tremor - dislodges the mud, so as to block the whole stream and the Jordan then runs dry where the road from Moab to Jericho crosses the river. This happened during the Crusades in A.D. 1264, and more recently in 1925, when it was observed that such an occurrence at the height of the Jordan flood would create exactly the conditions described in Joshua iii. 15 and iv. 23. Now, we have no means of verifying that the human event - the crossing of Jordan - really occurred: but it obviously could have happened as a result of a natural sequence of cause and effect. The odds against its happening at the precise moment required, are astronomical: but that is where the systematic hypothesis can suggest a solution. If there is a similarity of pattern in the geo-physical and the human situations, then the question of improbability does not arise. In the present paper, I shall discuss the evidence in favour of an even more remarkable example of historico-geo-physical homology consisting in the simultaneous disappearance of Plato's Atlantis, the destruction of the culture of Minoan Crete, the Exodus of the Israelites from Egypt, the flood of Deucalion recorded in Greek history, and a prodigious explosion of the volcanic island of Santorin, accompanied by earth tremors of exceptional severity. One of the most remarkable developments in our knowledge of Greek and biblical history, since Schliemann rediscovered Troy, is due to Professor Angelos G. Galanopoulos, Head of the Seismological Department of the University of Athens, whose published articles and information, sent to me in private correspondence, have provided the key to an interpretation of Plato's story of Atlantis that is, I am sure, the right one. I myself have reached some further conclusions, particularly as regards the connection between the destruction of Atlantis and the Exodus of the children of Israel from Egypt. For these conclusions I alone take the responsibility. They are so startling that I put then forward at this stage only as striking illustrations of the general theme that there is a connection between geophysical occurrences and some of the major events of human history. We must begin with Plato's story, as we have it in the Timaeus and the Critias.l The first question is whether the story was intended to be, and can be accepted as, an historical account of events that actually occurred; or whether, as most scholars have supposed, it was a myth invented by Plato to illustrate his theme. I am sure that Plato intended the story of Atlantis to be read as history. It is not relevant to the main subject matter of the Timaeus, and Plato seems to have brought it in because he was genuinely impressed by what he had heard from Critias. He refers to it several times as an authentic tradition, whereas in the case of other stories, for example the tale in Book X of the Republic or that of Er the son of Arminius the Pamphylian, he speaks of `tales which have been preserved'. No one who reads the Timaeus and Critias, and compares the account of Atlantis with the tales and fables in other "dialogues, can doubt that Plato believed that the two islands of Atlantis really existed, and that one was destroyed by a sudden catastrophe. Moreover, he gives a clear account of how the story came to his knowledge. He tells us that Solon, the great law giver of Athens, had in his early travels visited Egypt, and, while discussing the story of the Flood of Deucalion, had been told by the Egyptian priests that the Greeks were mere babes who had no knowledge of the ancient past. He had then been told the story of the rise and fall of Atlantis, in which the Athenians played a dramatic and noble part, and had decided to write an epic poem based upon what the priests had told him. The aged Critias, who had known Solon, was convinced that the poem would have been written but for Solon's preoccupation with Athenian affairs, and that it would have rivalled, or even surpassed, Homer's Illiad. 1 The extracts from the Timaeus and Critias are taken from Jewett's translation. The Greek text consulted is that of Albert Rivaud in the 1925 edition of the Complete Works. It is generally agreed that the Timaeus and Critias were the last works written by Plato before the Laws, his final book. The connection between Atlantis and Crete is never suggested in the Timaeus and Critias or earlier works; but there is a passage in the Laws (704.15) which suggests more than it says : "In days of old", says Cleinias, "there was a migration of inhabitants (from Crete) and the region has been deserted from time immemorial. When Jowett made his translation of Plato, he discussed the story of Atlantis as an invention of Plato himself, with no historical foundation whatsoever. The same sceptical attitude was formerly shown towards the Homeric poems and the stories of the Old Testament. Archaeological discovery has proved that this sceptism was largely unjustified. Since Schliemann rediscovered Troy and Mycénae, our attitude to Homer has become one of great respect for his historical accuracy. The same is true of Herodotus and Hesiod. This vindication of ancient writing has been equally striking as applied to the Old Testament. The tendency today is to take ancient traditions very seriously, and this alone should justify us in accepting Plato's assessment of the Atlantis story as probably correct. When, however, we come to study the story itself, we find that there are contradictions that make it impossible to take the whole of it literally. These contradictions concern the chronology on the one hand, and the description of the culture and relationships of Atlantis on the other. According to the story told by Critias, Solon was informed by the Egyptian priests that Athens had existed 9,000 years before, and had been engaged in a life and death struggle with the kings of Atlantis when the great destruction suddenly occurred. He adds that the story was written down a thousand years later. This in itself throws doubt upon the chronology, even before we begin to study its implications. 2 Hawes, C. H. and H. Crete the Forerunner of Greece. London 1909 p.17. 3 We should here mention the vast and in most cases fantastic literature that associated the `Lost Atlantis' with a great island in the Atlantic Ocean. A bibliography compiled by A. Roux and G. Lattejoue in 1920, contained 1,700 references to the Atlantean legend. An early impulse to a series of extravagant conjectures came from Ignatius Donnelly's book Atlantis, the Antedeluvian World which was drawn upon by H. P. Blavatsky in writing the Secret Doctrine (Book IV pp. 311-30). This, in turn, gave rise to a spate of inventions, none of which have any historical, archaeological or geological foundation, concerning the manners and customs of the Atlantean Race. All falls to the ground in face of the evidence that Plato's Atlantis belonged to the bronze-age culture. If Plato's account is put aside, then nothing remains but a few uncertain references in Herodotus and Homer, that are as unmistakably bronze age as the Atlantis of the Critias. A serious attempt to give a scientific foundation for the 'Great Atlantis' theory, was made in 1945 by George Poisson, Professor of Ethnology and President of the Societe Prehistorique Française in his book L'Atlantide devant la Science. He suggests that the Atlantean race were the same as Cro-Magnon man who flourished 15,000 to 25,000 years ago and could not possibly be the Atlanteans of Plato's story. Remove Plato, and Atlantis is a modern invention, a kind of psuedo-science fiction. Keep Plato, and Atlantis must be a bronze age culture of some islands in the Mediterranean. As there is no sign of any such culture other than the Minoan, we must conclude that if Plato's Atlantis cannot be identified with Crete, the whole story is a myth with no historical foundation. well with the description given by Critias. The mistake is a simple one and easily made, and it does not seriously detract from the historical value of Plato's account. Now, if there was a mistake in the reading of a symbol, whereby 100 was read as 1,000, this would no doubt apply not only to duration of time, but also to distances. It is very probable, therefore, that, when Plato refers to the great plain of Atlantis as being 3000 x 2000 stadia in extent, we should read 300 x 200 stadia. As the old stadium was about 600 feet, this would make the measurements 100 x 70 miles instead of 1000 x 700. The smaller figure is far more plausible, because in the second millenium B.C., there were no means of measuring distances as great as 1,000 miles. It seems, then, that we can make sense of Plato's story if we change 9,000 years into 900, and the size of the plain of Atlantis from 1,000 x 700 to 100 x 70 miles. This latter change makes it unnecessary to suppose, as Plato did, that the island of Atlantis must be situated in the Atlantic Ocean. There are good reasons for supposing that it must have been in the Eastern Mediterranean, partly on account of the names, and partly on account of the references to Hercules, whose journeys and labours were confined to the Eastern Mediterranean. Geologists are quite satisfied that there has not been within the last 10,000 years any great island in the Atlantic Ocean, and, in any case, an island of such size could not possibly have disappeared in a sudden convulsion of the kind that Plato describes. 4 Mackenzie, Donald A., Myths of Crete and Prehistoric Europe. London, 1917, p. 106. Chapter 5 of this book is entitled Crete as the Lost Atlantis and contains many suggestive arguments, that fail to convince, mainly for the lack of an explanation as to how the disappearance of Atlantis beneath the ocean can bp reconciled with the continued existence of Crete. There are, however, other convincing reasons for identifying Plato's Atlantis with Minoan Crete. Crete was a thalassocracy, the first great sea power in history. Its strength lay in its fleet. Plato says the same of Atlantis. Poseidon, the sea God, was the protective deity of Atlantis, as befits a nation whose very existence depended upon sea power. The symbol of Poseidon was the trident which also occurs in many of the Cretan frescoes. The sacred animal of Poseidon was the Bull, and the Minoan paintings and sculptures represent the bull as the central theme of their cult. The bull is probably the decisive link between Plato's Atlantis and Minoan Crete. Plato describes the way in which the kings of Atlantis hunted the bull without weapons at the time of their great sacred festivals, held every six or seven years. The famous fresco at Knossos, usually called the Toreador Fresco, shows just such an exploit. The legend of the Minotaur was associated with King Minos of Crete, and very probably the story told of the young men and women sent to be sacrificed to the Minotaur, and of its slaughter by Theseus, refers to ancient memory of the sacred meetings described by Plato in connection with Atlantis. There are many such parallels. Plato says that, after the bull hunt, the kings of Atlantis put on splendid blue robes. The frescoes of Knossos show that blue was the royal colour, and there is evidence that the blue dye first reached Asia from the Cretan traders. Here, again the link between Atlantis and Minoan Crete is suggested. For more detailed evidence we must turn to the archaeological work of Evans, Hogarth and Mackenzie,' confirmed and extended in all its essentials, by subsequent investigations. No one doubts today that a very great culture, maintained by a rich thalassocratic power, existed in Crete more than three thousand years ago, and perished so completely that its very memory was lost to the civilised world, until Evans made his discoveries early in the present century. We are not concerned with possibly controversial details of dating and ascription, but with the historical reality of an empire that endured for more than 2,000 years - from 3500 B.C. to 1400 B.C. Throughout this long period, Crete was the seat of the most advanced culture of the Mediterranean. Until about 2600 B.C. the culture was Neolithic, that is Stone Age, associated with agriculture and husbandry, and no metals were used. After 2600 B.C., copper weapons and tools began to appear. Not long after, came tin and, with tin, bronze. The bronze age in Crete was one of the earliest in time, and this suggests that it is possible that the Cretans first discovered the way to make bronze, because they had the sea trade that brought tin from the west, even from as far as Cornwall. Whatever may have been the reason, by about 2600 B.C., Crete had achieved an extraordinary degree of prosperity. The great palaces were built and Cretan trade began to penetrate into all parts of the inhabited world. About 1700 B.C. there was a destruction, and this was probably due not to enemy action, but to an earthquake. This was local: palaces were soon rebuilt, and the Cretan thalassocracy was re-established. There was another destruction between 1450 and 1400 B.C., this time so terrible that the Minoan power was destroyed for ever. This brief history of Crete fits Plato's description, if we suppose that the final destruction was caused by a catastrophe of such exceptional severity as not to have spared a sufficient proportion of the population to make reconstruction possible. Such a catastrophe could not have been caused by an earthquake alone. Terrible earthquakes have occurred many times in populous regions and have caused appalling material destruction and loss of life, but never has an earthquake destroyed an entire nation. The usual story is that of destruction, followed by a period of disarray, and subsequent complete reconstruction; this had occurred more than once in the earlier history of Crete. Most authorities writing shortly after the excavations of 1899-1904 were agreed in attributing the destruction to enemy action. Baikie7 writes: `That there was a huge disaster which broke forever the power of the Sea-kings is unmistakable. The Minoan kingdom did not fall from over-ripeness and decay, as was the case with so many other empires. The latest relics of its art before the catastrophe show no signs of decadence: the latest specimens of its linear writing show a marked advance on those of preceding periods. A civilization in full strength and growth was suddenly and fatally arrested'. Donald Mackenzie,' who accepts the theory that Crete was the lost Atlantis of Plato, does not seem to have surmised that the destruction of Knossos and the five cities was due to volcanic action. He writes of invaders from the Greek mainland as the probable destroyers of the late Minoan II culture. Indeed, he writes4 'When Crete was suddenly overwhelmed by invaders at the height of its power and prosperity, and its sailors and traders vanished from the Mediterranean, many wild rumours must have obtained currency. It need not surprise us to find that some believed the island itself was "plunged beneath the sea", and that in time, the age during which flourished its kings, and seafarers and bull-baiters, "won its way to the mythical", as Thucydides says in another connection'. By the time he wrote the Palace of Minos,' Evans had changed his mind about the tragic ending of the late Minoan culture, and concluded that it could not be attributed to human agencies alone. Later writers, including J. D. S. Pendlebury,9 the devoted curator of the Palace of Minos, and his editors Myres and Forsdyke, cautiously refer to `earth-quakes and possible enemy action': but no one can suggest where enemies possessing a fleet powerful enough to overthrow the Cretan navy of 1450 B.C. could have come from. The theory of an invasion from the Greek mainland seems untenable in view of the absence of evidences of any advanced culture in the first half of the second millenium B.C. Invasions from Egypt or Syria are excluded on any interpretation of the very extensive records and monuments. But, above all, there is the unlikelihood that any invading fleet necessarily small in numbers of men engaged - could or would have undertaken such wholesale destruction. Even such ruthless conquerors as Sennacherib or Timurlenk whose great hordes razed Babylon and Baghdad, did not succeed in blotting out the entire culture they set themselves to destroy. Evans' theory of a great earthquake also fails to account for the destruction, with its evidences of fire and water, rather than of ground movements. No recorded earthquakes have produced destruction of the kind shown in the centre of the plain of Crete.
' 7 Baikie, James. The Sea Kings of Crete, 1913, pp. 170-187. 8	Evans, A. S. The Palace of Knossos 1921-1935. In this monumental work, Evans has left the conclusions of nearly forty years work in Crete. He leaves open the problem of accounting for the sudden destruction of late Minoan II at the height of its glory. The volumes contain many evidences of the suddenness of the destruction. The disappearance of gold and other valuables may be due to raiders, years or even centuries, after the event, and is no proof that the destruction itself was due to an invading enemy. We should, therefore, look for a catastrophe of a more generally destructive kind, the action of which could destroy cities and ships and kill off nearly the entire population. This could hardly be confined to Crete alone, and so our attention is drawn to a striking discrepancy between known Cretan history and the Platonic legend. ln comparing Minoan history with the story of Atlantis as recounted by Critias, we must allow for the assertion that there was a second and smaller island, which was sacred to Poseidon and which was the religious centre of the federation of the kingdoms of which Atlantis was comprised. Plato refers to Atlantis as being a federation of ten kingdoms, and he also refers to the presence of a small but sacred island which was the place where Poseidon first established the future rulers of Atlantis." If Plato's story is history, there must have been a small island, near to Crete, upon which there stood the temple and the other buildings described in such minute detail in the Critias. It is well-known that all attempts to find temples and other evidences of the religious life of the Minoans have failed. Neither Knossos nor Hagia Triada could have been centres of the cult. And yet there is plenty of indirect evidence that the Minoans had a highly developed set of religious beliefs and practices. Where were they centred? This is where Professor Galanopoulos has made a decisive contribution to our knowledge. He has given good reasons for supposing that the sacred island was Stronghyle, now known as Thera or Santorin, situated some sixty miles north of Crete.11 It has long been known that this island was an extinct volcano which blew up 3,000 or 4,000 years ago, producing a great crater or caldera, which has since been partly filled by fresh eruptions from under the sea. Galanopoulos, by obtaining the samples of carbon from under the layers of volcanic dust thrown out at the time of the explosion, and subjecting them to the method of radio-carbon dating, has established that the catastrophe occurred 3,300 years ago, plus or minus 100 years before the present, that is, within 100 years before or after 1460 B.C. This date agrees with the archaeological estimates of the time of the final destruction of the Palace of Knossos, which was placed at the end of the 14th century B.C. I shall give you reasons later for supposing that the precise date was 1447 B.C. This is somewhat earlier than the time assigned by archaeologists to the destruction of Knossos, but certainly it is not inconsistent with the findings of Cretan archaeology. Professor Galanopoulos himself has suggested a date of 1550 B.C., but this is certainly too early to fit in with the archaeological evidence. Now the question comes whether the great submarine volcanic eruption in Santorin could have produced the destruction of Minoan Crete. This destruction was so devastating that all the palaces at Knossos, Phaestos, Hagia Triada, Gourma, Moklos, Mallia and Zakros were completely destroyed. Very probably the entire population was wiped out, because no attempt was made to rebuild, and the later and pitiful local revivals were almost certainly due to immigrants from Mycenae and Tiryns on the mainland of Greece. 10 Critias. 114. `All these and their descendents were the inhabitants and rulers of divers islands in the open sea; and also, as has been already said, they held sway in the other direction within the Pillars of Hercules as far as Egypt and Tyrrhenia'. 11 The island in its original state had a superficial area of about 250 square miles. It is variously referred to as Stronghyle, Santorin, and Them, though the latter name applies properly only to the major remaining fragment. The question can be answered by comparing the intensity of the explosions at Santorin with those of some of the greatest known sub-marine volcanic eruptions. Intensities can be calculated from the area and depth of the caldera or submarine craters formed in each case. Few people realize the prodigious energies that are released when thousands of millions of tons of sea water pour into vast cavities to reach the white hot molten magma that lies beneath volcanoes, not far below the surface. It is desirable to have some picture of these terrible events. There have been some fairly severe earthquakes and volcanic eruptions within recent times, but we tend to forget what they were like. Probably the greatest that ever occurred in Europe was the earthquake of Lisbon in 1755. 40,000 people perished, and the whole of the sea-front of Lis-bon disappeared in the sea. People who rushed out of their houses to go on to the newly completed quay were drowned, as the quay itself was engulfed about 100 feet below the surface of the sea. The whole of the great Portuguese Fleet and a number of ships from the Americas that were there, disappeared without trace. All this caused such complete chaos that the entire history of Portugal was changed. When we read" Galanopoulos, Angelos G., Z�r Bestimmung des Alters der Santorin - Kaldera. Ann. Geol. Pays Hell. VoL 9, 1958, pp. 185-188. The main hypothesis is set out in a paper On the Origin of the Deluge of Deukalion and the Myth of Atlantis. Athens, 1960. histories of Portugal, we may see a strange lack of interest on the part of historians in the human experience of being exposed to such an event." We can scarcely imagine what it would be like to see a great part of our city disappearing into the sea before our very eyes. 15 Livermore, H. V. A History of Portugal. London, 1947. " Raffles, Thomas Stamford. The History of lava. 1820. Vol I, p. 25-28 notes. The great eruption of Krakatau produced a Tsunami or tidal wave 100 feet high that went as far as Australia 1,000 miles away. This tidal wave was felt at Aden and on the coasts of India. The sky was darkened for about five days and the actual sound of volcanic explosions could be heard about 1,000 miles away. 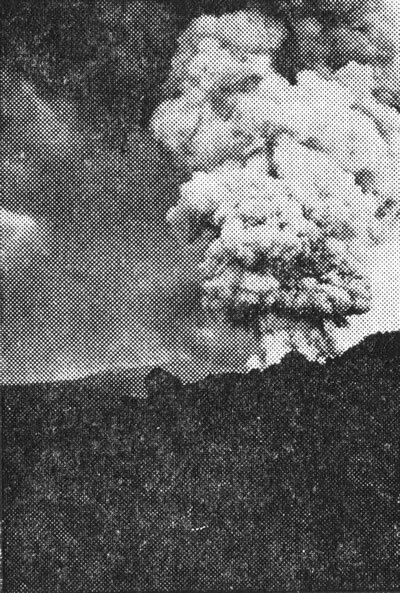 Volcanic dust went all round the earth, and for about three years sunsets were affected by clouds of dust that came from this explosion. About thirty square kilometres of this mountain fell into the sea, and a great crater was produced. This was one of the greatest volcanic eruptions ever recorded. The reason why this particular kind of volcano is so terrible is that it occurs from beneath the sea. When the eruption begins, the sea water rushes down to the molten lava, perhaps at considerable depth, where it is turned into steam, the pressure of which increases to an intolerable degree. The result is that the inside of the crater is blown to pieces. As it is blown open in this way, there is a fresh rush of sea water into the crater and this caused a fresh explosion, which may continue for days or even weeks until the magma solidifies. 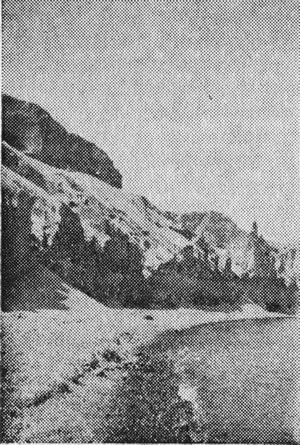 A recent example is the great Alaskan earthquake of the 10th of July 1958 which produced the giant wave in Lituya Bay, an unpopulated area. The wave produced by the explosion raised the waters to a height of 1,800 feet. This is shown by the fact that they actually poured over the top of a mountain 1720 feet high; to a height of 700 feet above sea level everything was denuded. The following quotation from Miller's description will give you some idea of the tremendous destruction. 'An addition to the conclusive field evidence that water did over-turn trees at the highest point on the trimline . . . as described in the preceding paragraph, the following supports the interpretation that water, rather than avalanche or sliding, was the prime factor in denudation of the spur; both Ulrich and Swanson mentioned seeing water dash over the spur. The timber across the spur is sharp and even, and similar to and continuous with the trimline, known to be due to the water action in the outer part of the bay. The "washed" appearance of the bed-rock surface extends almost to the highest point on the trimline. Overturned trees along the trimline, to an altitude of about 700 feet on the south-west face of the spur are preferentially oriented parallel to the trimline (and with their tops to the west) not parallel to the steepest slope, as they should be if filled by sliding or avalanching. The maximum height of destruction - 1,720 feet where water surged across the spur on the south shore - far exceeds the previously reported record height of wave rushes' 16 15 Symons, G. J. 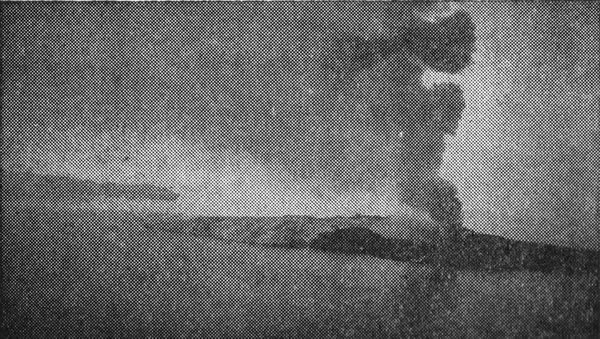 The Krakatoa Eruption. Report of the Krakatoa Committee of the Royal Society. This monumental work is the best study ever made of a submarine volcano eruption of the type to which Santorin belongs. I witnessed a similar, though far lesser, explosion 37 years ago, in 1925, and it left a quite indelible impression on my memory. 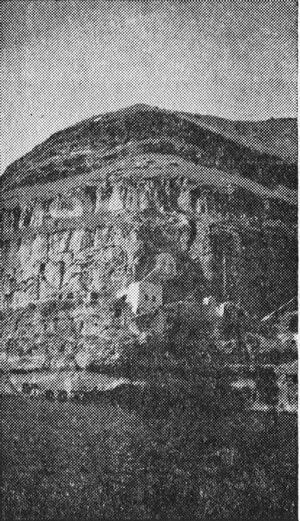 This was at the very island in the Aegean, not far from Crete, named Santorin or Thira, to which I have already referred. This island was destroyed about 3,400 years ago by a great convulsion similar to Krakatau but far stronger. Since then, on six or seven occasions, the volcano has opened and fresh lava has come up from below until new islands have begun to be formed. One such explosion occurred in April 1925. I was in Athens at the time, and, as soon as it was reported that an explosion had taken place, a Greek ship-owner sent out people to inform whoever might be interested that he was leaving in two hours' time for the island. When the ship left for Santorin it was crowded. We went with a party of six to seven to see this, arriving within 24 hours of the first explosion. As we approached, we could see great clouds of dust going high up into the sky. The photographs (figs. 1 & 2) accompanying this paper are suggestive of atomic bomb explosions, and indeed the energy released is of the same order. The sea was covered with pumice and sulphur; it was an extraordinary sight to see the sulphur and pumice stone as it came up from the depths. There were great thundering noises and rocks were being thrown out of the crater. In one place, we watched a rock the size of a house thrown out of the centre of the crater. A new island had been formed. The sea was boiling and boiled fishes could be seen floating in the sea. Unaware of the dangers, we took a row boat and rowed out to see the new island. We bathed in the hot sea amid the pumice stone and sulphur, and then climbed on to the new part of the island. Not more than half-an-hour after we had left, the volcano blew up again. This was really a tremendous sight for us to witness, but it was a mere nothing compared with the original explosion. That quite terrifying spectacle had not one ten thousandth part of the intensity of the original explosion, when the centre of the original large island collapsed into the bowels of the earth. 16 Miller, J. S. Bulletin of the Seismological Society of America. Vol. 44. 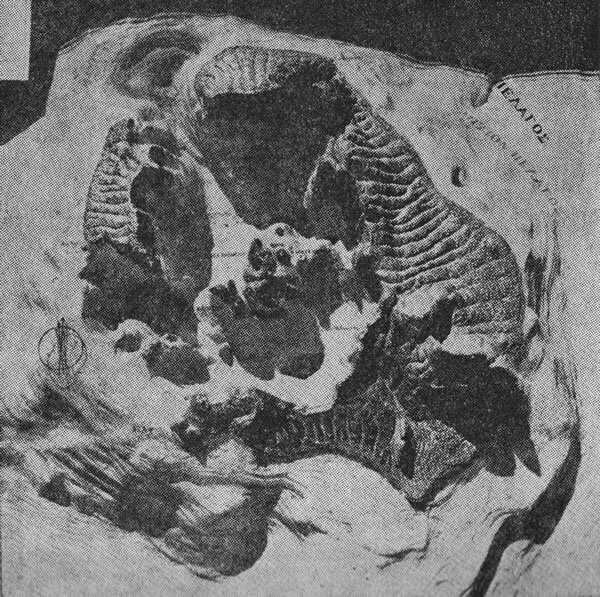 Oct. 1958, p. 406. A fuller account is given in the bulletin for 1960. These descriptions may convey some idea of this sort of catastrophe. What happened at Santorin must have been far more terrible than what happened at Krakatau. At Krakatau a great deal of the energy built up, was dissipated into the open ocean to the South, whereas in Santorin it is all enclosed within the Eastern Mediterranean, and the tidal waves would return upon themselves to produce the utmost havoc. To give you some idea of the prodigious intensity of the great explosion of 1447 B.C., I will make a comparison with Krakatau. There the caldera was some 14 square miles, and its depth about 600 feet. The caldera at Santorin was 35 square miles and from 1,000 feet to 1,500 feet deep. The ash thrown out at Krakatau over an area of some ten thousand square miles had an average thickness of a foot. At Santorin the actual thickness of the ash and dust on the island itself was from 100 to 130 feet. I myself went and visited the eastern side of the island where the layers of ash and volcanic dust have been laid bare by wind action; it is shown in the photographs (figs. 3, 4 & 5). It is one of the most desolate and terrifying places that I have seen. It is hard to imagine that those great cliffs of volcanic dust were produced in a matter of days. The thermal energy" of the eruption at Santorin in 1447 B.C., has been calculated by Professor Peter Hedervari at 200 billion kilowatt hours. To give you some idea of the amount of energy released, I have calculated that this is enough to raise four hundred million tons of sea water to a height of six thousand feet. There must have been an enormous tidal wave more terrifying than any description. At the centre of the explosion it must have risen to a height of several thousand feet. Can you picture a mountain of water, hundreds of feet high, rising out of the ocean and spreading out in every direction, with all the added intensity of a landlocked ocean like the Mediterranean? The great wave must have swept southwards sixty miles to Crete, smashing everything in front of it. If the wave started at a height of 6,000 feet, it would have fallen to about 60 feet when it swept over the central plain of Crete. Nothing whatever could withstand such a power. When it reached the hills it would have risen considerably higher, but it would not have killed shepherds high up on the mountains. There is direct evidence that the wave did in fact reach great heights, for lumps of pumice stone have been found to a height of 600 to 700 feet on the island of Anaphi. Pumice stone carried by the waves has also been found in the central mountains of Crete, 100 feet or more above the level of the sea. Not only this, but they have been found on the coast of Syria and in Greece, showing that the wave must have spread out all over the Aegean Sea, as far as Egypt and Syria. It seems to me that there can be no doubt that we have here the only adequate explanation so far put forward of the sudden destruction of the Minoan cities and culture in the middle of the Second Millenium B.C. In this destruction the whole of the Minoan fleet perished, and probably the population was killed, except those who were living on the mountains. This agrees with the description given by Plato where he says that all those who possessed the art of writing perished in the catastrophe, and only a few illiterate shepherds survived on the mountain-side, and they were unable to transmit to their descendants the story of the splendid civilization that had been destroyed. In the explosion of Santorin, we not only have the historical event which Plato describes, but we also have an explanation of the failure of archaeologists to discover the small sacred island and the temple of the sea god. The island was Santorin, and the temple stood just where the centre of the island disappeared into the sea. Professor Galanopoulos made a drawing of the Metropolis of Atlantis according to Plato's description, and has shown how exactly it fits in to the plan of the island of Santorin. (See figs. 6, 7 & 8). It seems therefore that the riddle of Atlantis has finally been solved. `The energy of the air waves : about 6. 1023 (= 430 X the energy of air-waves after the explosion of a hydrogen bomb ; the energy of the tsunami (in accordance with K. lida's method); 6. 1023 ergs (= 3.75 X the energy of the tsunami after the Chile earthquake in 1960). The energy of the volcanic earthquake 6. 10" ergs. There remains, however, the question as to how such terrible events could have been forgotten. Plato's explanation that only illiterate shepherds on the mountain-sides could have survived is not wholly convincing. There is, however, as Galanopoulos has shown, another ancient tradition which no doubt refers to the same event. This is the Flood of Deucalion. Deucalion was a king of Greece in whose time there was a great flood that destroyed Attica and all the surrounding country. Deucalion himself survived because he and his wife were able to take refuge in a ship. Unlike the story of Atlantis, that of Deucalion and his flood appears again and again in old Greek literature. The Greeks certainly regarded it as true history; even Aristotle, who was a sceptic and a scientist, accepts it as a fact, and takes it into account in his explanations of the natural order. It is of very great interest that the time of Deucalion can be dated with some confidence. On the island of Paros, in the Aegean Sea - where the famous Parian marble comes from - there is a marble pillar on which is engraved a list of the kings of Greece with the times that they ruled, calculated up to the first Olympiad. Deucalion is said to have flourished 700 years before the first Olypiad, the date of which is commonly fixed at 778 B.C. This gives the Flood of Deucalion a date somewhere about 1478 BC., thus agreeing remarkably well with the radio-carbon dating for the destruction of Atlantis, and the archaeological dating of the destruction of the Palace of Knossos of Minos II. If Deucalion's Flood was an historical event, then it can only have been produced by a tidal wave of the kind that is associated with a submarine volcano. This kind of eruption is associated with torrential rains. The eye-witness accounts, quoted above, of the earthquakes in Java refer to the days of continuous rain which followed them. In the story of Deucalion, it is said that the rain fell continuously for nine days, and that after this the flood subsided. Hitherto, Deucalion's Flood has been regarded as a mythical story, but, as has so often happened, scientific and archaelogical research now show that the myth is probably good sound history. Before I leave the subject of Atlantis and Deucalion's Flood, I should refer again to Plato's account of the ten kingdoms of Atlantis. From the discovery of Minoan objects in Egypt, Syria, Greece, Italy and Sardinia, it seems likely that the naval power of Crete held sway over the various peoples inhabiting the area which was described by Plato as stretching as far as Libya and the Tyrrhenian Sea." This would include the ancient Etruscans, and it may be that we have here the due to the origin of this enigmatic race. There is a certain affinity between Etruscan and Minoan art, but there is no sign of any contact between the peoples. May it not be that with the destruction in 1450 B.c. and the disappearance of the Cretan fleet, the Etruscans forgot about their earlier connection with Atlantis and could never account for their own origin? It is also possible that we can connect the Cretans with the Hyksos" who dominated Egypt for centuries, and seem to have come from nowhere and disappeared no one knows whither. This kind of thing can happen with sea power. For 200 years the British dominated India without a land invasion. When British sea power ceased to rule the waves, British rule soon disappeared from India, and if in 3,000 or 4,000 years archaeologists attempt to reconstruct the history of this century, they would find it hard to explain who were the people who came to India in the twentieth century and disappeared as mysteriously as they had arrived. These observations suggest that we may now be able to reconstruct the history of the second millenium B.C. if we understand better the rise and fall of Atlantis, which has been arbitrarily described by Evans as the Minoan kingdom, and may also have had many other names. This is not the whole story, for the great catastrophe of Santorin produced effects beyond the reach of its tidal waves. The great explosion did not disturb the water only: it also produced an enormous air pressure that was released in two ways; one was an explosive wave that travelled rapidly, and the other was an upward air current that produced great storms, rain and hail. There were also the prodigious quantities of fine dust that must have travelled for hundreds of miles. We know that the Krakatau eruption produced total darkness at midday over an area of five thousand square miles. Santorin must have produced similar effects upon a far greater scale. Remember that the dust layer round Krakatau was one foot thick, and that round Santorin - after three thousand five hundred years - is still more than 100 feet thick. Surely some record of such extraordinary events must have been preserved. If so where should we look for them? Generally speaking, ancient inscriptions preserve only glorious stories of successful wars and great buildings; so we should not expect to find the story of a disaster on the walls of temples or on monuments. It is not surprising that the peoples living in the coastal areas should have left no record of what happened in the second millenium B.C. We should naturally turn to Egypt, only a few hundred miles from Santorin and directly in the line of the prevailing winds. The first thought that occurs to us is to connect the catastrophe with the plagues of Egypt described in the Exodus and there is fairly good evidence to confirm this hypothesis; darkness over the land, stones of bail and rock pouring down, great winds, the Nile suddenly flooded and suddenly run dry, with frogs and flies infesting the town and, most terrifying of all, the destruction of buildings, so that there was not one house of the Egyptians in which there was not one dead. The descriptions are strangely reminiscent of the great explosion at Krakatau, the sound of which was heard in Australia one thousand miles away, and the dust from which spread all over the earth falling as far away as Africa and Europe. To test the suggestion that the plagues of Egypt coincided with the Santorin explosion, let us go back to chronology. Scholars are still uncertain as to the date of the Exodus. The simplest answer is given quite plainly in the Bible. In Kings vi it is written: "And it came to pass in the four hundred and eightieth year after the children of Israel came out of the land of Egypt, in the fourth year of the reign of Solomon over Israel, in the month of Zio, he began to build a house `to the Lord'." Now the reign of Solomon has been independently and accurately fixed as from 970-930 B.C. A simple calculation shows that this would place the Exodus at 1446 or 1447 BC. This calculation was adopted by Sir Charles Marston and he shows how well it agrees with what he found in the excavations made in Palestine. There are two objections to this date. One is that the children of Israel are said in Exodus xii.37, to have `set forward from Ramesses to Socoth'. Now Ramesses or Raamses was the city of the Pharaoh Ramses II who reigned from 1298-1232 B.C., and the name Ramses was not used in Egypt before the XIXth dynasty. The discrepancy is easily explained When the story of the Exodus was written, centuries after the event, Ramses was the capital city, and the scribes used it to denote also the capitals of Egypt in earlier times. It appears for example in Genesis xlvii as the city where Joseph settled his father and his brethren - at least two hundred years earlier than the Exodus. We can, therefore, safely disregard the references to Ramses. A much more serious objection is that in 1450 B.C. the ruler of Egypt was Thutmosis III, the greatest conqueror of the second millenium. At that time, he ruled over the whole of Syria and Mesopotamia, and over Egypt as far south as Nubia. It is inconceivable, say the scholars, that the children of Israel would have been able to leave Egypt and invade Canaan of which Egypt was in complete control. They argue that the Exodus must have occurred under a weak ruler such as the later Pharaohs of the XIXth dynasty. It is true that Thutmosis III was a most powerful autocrat but is that not the very picture that is drawn of Pharaoh in the book of Exodus? Nothing would have changed his heart, but a terror before which he was powerless. Just such a terror was produced by the explosion of Santorin. Everything was there: noise, darkness, the wholesale destruction of cattle, crops and buildings; great rains, hail and rock falling from the sky, which no other catastrophe could have produced. Whereas Atlantis was destroyed, Egypt was plagued. The entire machinery of government must have been disrupted, and for a long time, years perhaps, the rulers would have no time to do much about the departed Israelites. Is there any more specific evidence? The first and strangest is the date that Thutmosis III died, 1447 B.C., which is the year that the Bible assigns to the Exodus, the very year that I have assigned to the Santorin eruption and the destruction of Atlantis. From Exodus xv, it seems clear that the Pharaoh himself perished with his army and this is confirmed by the traditions: "For the horse of Pharaoh went in with his chariots and his horsemen into the sea, and the Lord brought again the waters of the sea upon them." The army that followed the Israelites could not have been large. It is of some interest here to note that a numerical error seems to have crept in with the account of the Exodus, similar to that of the Critias of Plato. The Hebrew text refers to 600,000 Israelites setting out on the journey. It would be manifestly impossible to control or to feed such a multitude, and I am inclined to accept Ben Gurion's theory that the true number was 600 souls. Are we then to conclude that Thutmosis III was the Pharaoh of of the Exodus? This seems to conflict with Exodus i�.23, which records the death of the king of Egypt. I believe that the reference here is to Hatsheput, who was the regent and effective ruler of Egypt until her death in 1480 B.C. As is well known, she adopted a man's rights and was often referred to in the masculine gender. She was perhaps the Pharaoh of the persecution, and her son Thutmosis III was the Pharaoh of the liberation. I would not venture to give an opinion about this, but it is plausible to infer that the Exodus did take place about 1447 B.C., that it coincided with the death of Thutmosis III and also with the destruction of Minoan Crete and the Flood of Deucalion. I believe that no one has previously suggested a connection between Atlantis and the Exodus, but early Christian historians did connect the Exodus with the Floods of Deucalion and Ogyges." Eusebius, in his Chronicle, placed the Flood of Deucalion and the conflagration of Phaeton in the fifty-second year of Moses' life20 Augustine, in the City of God, connects Deucalion's Flood with the Exodus. I have not mentioned the story of Phaeton and the disappearance of the sun, but this may well be accounted for as the days of complete black-out caused by the Santorin dust. More-over, we must not forget that the explosion itself probably produced a flash that might well have been mistaken for the burning up of the sun itself. There are many confident references to Deucalion's Flood as a part of Greek history. Aristotle himself, who was little inclined to attach importance to myths, refers more than once to Deucalion in his discussion of natural disasters. We may safely conclude that the Greeks were as convinced of the historical reality of Deucalion and his flood as were the Jews of their miraculous liberation from their Egyptian oppressors. It now seems that all these events were linked together by a common cause - the great Santorin catastrophe.
" Petrie, W. M. Flinders. Hyksos and Israelite Cities, pp. 10-16. 19 Garstang, John. The Foundations of Bible History. New York, 1931, connects the invasion of Palestine with the reign of Amenhotep III and assigns it to the year 1407 B.C. Accepting the forty years in the desert as accurate, this gives 1447 B.C. as the date of the Exodus in agreement with Kings VII. 20 Julius Africanus in The Ante-Nicene Fathers wrote: `We affirm that Ogyges from whom the flood of Attica derived its name, and who was saved when many perished, lived at the time of the Exodus of the people from Egypt along with Moses'. He adds the telling remark When the Egyptians were being smitten by the anger of God with hail and storms, it was only to be expected that certain parts of the earth should suffer with them'. Ed. A. Roberts and J. Donaldson, 1896, Vol. I, pp. 132 and 134. So much then for the evidence that the Israelites were aware of the connection between the Exodus and a tremendous catastrophe, and that there was a traditional belief to this effect known to Augustine and other patristic writers. We cannot be satisfied with this evidence unless it is confirmed from Egyptian sources also. Here we are fortunate to be able to draw up on the researches of Immanuel Velikowski21 His work has largely fallen into disrepute because of the totally unacceptable hypothesis of migrations of the planets, Venus and Mars, within historical times. Nevertheless, the evidence produced by Velikowski of some great catastrophe that occurred in the second millenium B.c. has remained unanswerable and inexplicable, until Galanopoulos came forward with the account of the Santorin eruption. The inscriptions also contain a reference to a march of the king which ended in the death by drowning of himself and his army in a sudden flood at a place called Pi-Kharoti; which is evidently the same as Pi-hahiroth of Exodus xiv.9. Even more remarkable, since it does not appear in Exodus, is the story of the prince Geb who set out to find what had happened after the first catastrophe, and was killed, with all who accompanied him, by a terrible blast. When I first read this account of an Egyptian scribe, it seemed to me that he might have been watching the very occurrences that one would expect from the great catastrophe in Santorin, when you are far enough away not to be blown to pieces by it, but near enough to feel the blast and experience all the terrors. The question naturally arises as to the dating of the Ipuwer papyrus. The actual copy was made during the XIXth Dynasty, but the spelling is, on the whole, that of the Middle Kingdom. The text refers to a civil war and may relate to the expulsion of the Hyksos, or, just possibly, to the Exodus. The reference to the Great Houses (Law Courts) certainly places the events earlier than 1400 B.C., since such buildings were not in use at any later date. We should remember that the papyrus refers to the destruction of the Great Houses and the common people digging in the ruins. The conclusion to be drawn from these observations is that the event described by the original writer must have taken place between 1400 and 1500 B.C., and no comparable natural catastrophe is known except the Santorin explosion. This agrees with Flinders Petrie's interpretation of the inscription at Speos Artemidos24 which refers to Queen Hatsheput and the destruction of her abode by a great catastrophe. Altogether, it seems that there is ample justification for taking very seriously the hypothesis that the events described in Exodus left their mark in the Egyptian records, and that the common origin of the various accounts was the Santorin catastrophe. "Gardiner, Journal of Egyptian Archaeology I (1914). The original is in the Leningrad Museum. 23 Lange, G. H. Sitzber d. Deutsch. Aka. d. Wiss. Vol. 78, 1903, p. 601 translates the text into German. The orignal is in Leyden Museum where it was recently inspected by my friend Ing. G. Tlalsma. It is worth adding a last reference to ancient floods. There is an arresting similarity, as you probably know, between the Deucalion Flood, the Flood of Noah, and the Flood of Utnapishtim in the Gilgamesh epic. One might infer that they all referred to the same event, but this is geographically very unlikely. There could not be that kind of sudden event which produces great floods over such enormous areas; changes of the ocean bed are too slow to produce anything that could correspond to these various flood stories. But as we can see from Krakatau, from the great one at Santorin, a certain situation can arise, where a volcano blows up under the sea and produces flood conditions, coupled with long and unceasing rainfall. And it seems on the whole likely that there have been different floods, when survival depended upon people who were able to take refuge, who were at a sufficient distance from the centre to float through them on a raft or ship. A great deal of light can be thrown on these flood stories, of which there are many in the different traditions of the world, by the work of Professor Galanopoulos on the effects of a submarine volcano. Such events do occur from time to time, especially in the earthquake belt, and when they occur, then conditions arise that correspond to all descriptions of floods. My own belief is that such occurrences cannot be ascribed to mere chance. There is in no case an action that violates the well-established laws of the natural order. Energy is conserved, the changes can be assigned to a natural sequence of cause and effect. But, from the human point of view, there is something altogether amazing in the coincidence of natural catastrophes and great historical events. It is by their immense improbability that such coincidences deserve to be called miraculous. The miracle is in the timing. The interpretation of miracles supported by the present study is that they occur, not by violating laws, but by the extreme improbability of their timing. I have given elsewhere25 examples of such unaccountable cases of synchronicity. If I turn over a beetle lying on its back in the sun, I do not change the course of nature, but I do save the life of the beetle. My intervention is totally unaccountable in the world of beetles. The remarkable coincidences described in this paper obey natural laws. No problem arises from the point of view of geologists, seismologists or climatologists, in explaining how such things could occur. But that they should have happened just then, and in just such a way, is against all probability. If these three remarkable events of ancient history - the Flood of Deucalion, the destruction of Plato's Atlantis and the plagues of Egypt and the Exodus - did all occur as con-sequences of a single natural catastrophe, then it is one of the strangest and most important of the natural occurrences that have changed the course of history; we are left with a question that cannot be answered on the ground of a single event, however awe-inspiring - the question whether there is a hidden link between earth occurrences and human history. 24 Petrie, W. M. Flinders. A History of Egypt during the Seventeenth and Eighteenth Dynasties. Vol. 2, p. 19. 25 Bennett, J. G. Lectures on Natural Catastrophies that Change History, Oct. 1962.